Ridgid introduces the next generation in power tools with the GEN5X Five-Piece Combo Kit. The GEN5X five-piece combo kit, consisting of a hammer drill, impact driver, circular saw, reciprocating saw and an LED flashlight is full of best-in-class features that are backed by the industry's best warranty, the Ridgid Lifetime Service Agreement. GEN5X permanent magnet motors have been engineered to provide best-in-class power, performance and runtime, giving you the advantage on any jobsite. This kit is powered by 4.0 Hyper Lithium-ion batteries, which have four times the runtime compared to standard lithium-ion batteries and an arsenal of features such as; 50% longer life, triple protection electronics, best-in-class extreme weather performance and fuel gauge. Free Batteries. Free Parts. Free Service. For Life. The BLACK+DECKER LDX120PK 20V MAX* Lithium Drill & Project Kit is a great kit for a variety of home projects. Includes 20V Lithium drill, which provides an extra level of control with an 11 position clutch that prevents stripping and overdriving screws. This kit includes 66 hand tools and accessories and a carrying bag for easy portability and storage. Includes carrying bag for easy portability and storage. The new Bosch CLPK237-181 18 V combo kit with HDS181 Compact Tough hammer drill/driver and 25618 impact driver are compact and lightweight for better balance and control. These tools are ideal for working in tight spaces. The new high capacity Lithium Ion batteries work longer and smarter, even in colder temperatures as low as -4F/-20C. Both tools are compatible with all Bosch Lithium Ion batteries and chargers. 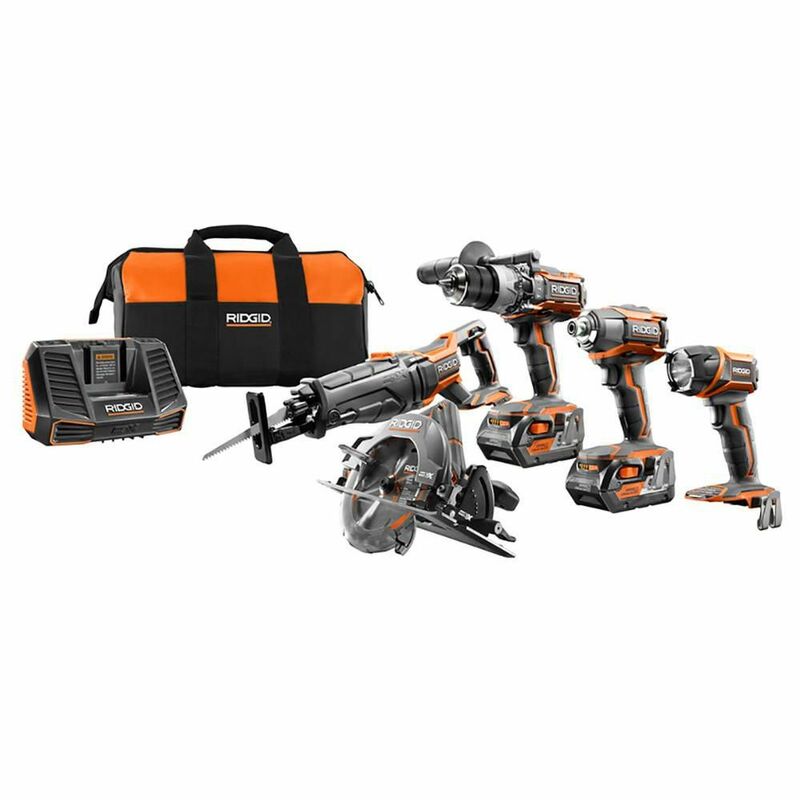 18V Lithium-Ion Cordless Combo Kit (5-Tool) w/ (2) 4.0 Ah Batteries, 18V Charger & Contractor's Bag Ridgid introduces the next generation in power tools with the GEN5X Five-Piece Combo Kit. The GEN5X five-piece combo kit, consisting of a hammer drill, impact driver, circular saw, reciprocating saw and an LED flashlight is full of best-in-class features that are backed by the industry's best warranty, the Ridgid Lifetime Service Agreement. GEN5X permanent magnet motors have been engineered to provide best-in-class power, performance and runtime, giving you the advantage on any jobsite. This kit is powered by 4.0 Hyper Lithium-ion batteries, which have four times the runtime compared to standard lithium-ion batteries and an arsenal of features such as; 50% longer life, triple protection electronics, best-in-class extreme weather performance and fuel gauge. Free Batteries. Free Parts. Free Service. For Life. 18V Lithium-Ion Cordless Combo Kit (5-Tool) w/ (2) 4.0 Ah Batteries, 18V Charger & Contractor's Bag is rated 4.7 out of 5 by 1003. Rated 5 out of 5 by Almo from Excellent equipment no matter the job it's perfect. Excellent equipment no matter the job it's perfect. Can the batteries from the X4 series work with the X5 series and can the X5 batteries work with the X4 series? Not the same driver. Yes 1/4 inch he head. It all in the description.